What’s lurking in the undergrowth? The Skomer vole is a sub species of bank vole that is endemic to Skomer, it is one of four small mammals on the island, including the wood mouse, common shrew and the pygmy shrew. It was thought that the bank vole was introduced to the island by accident possibly by a boat, and they have been on the island for so long that they have become genetically different to the mainland bank vole, creating a new subspecies. 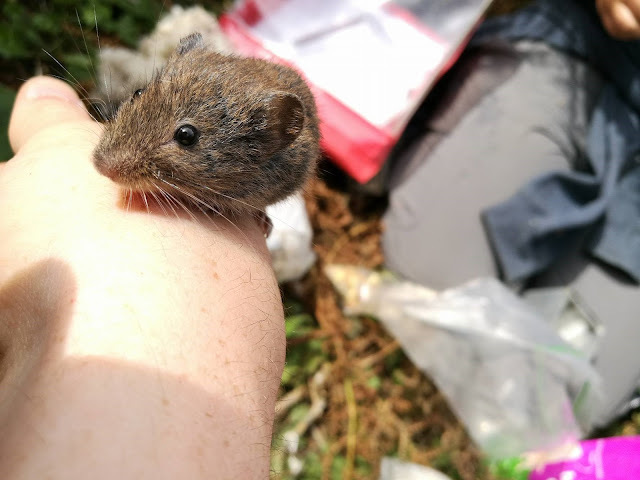 The Skomer vole is larger and has slightly different behaviour to the mainland bank vole; they are not used to having any ground predators and so are quite tame. They are only used to aerial predators and so stay still when they feel threatened. During my time trapping them, I have gotten to know certain animals very well. Last year, ‘Endless’ was my favourite (a juvenile male with no tail) and this year it is an adult female (number 918) that I watched foraging around the bracken in the evening, I have caught her almost every night. The likely hood of seeing the Skomer vole is normally quite slim but if you are lucky, you could catch a glance on one running across the path. 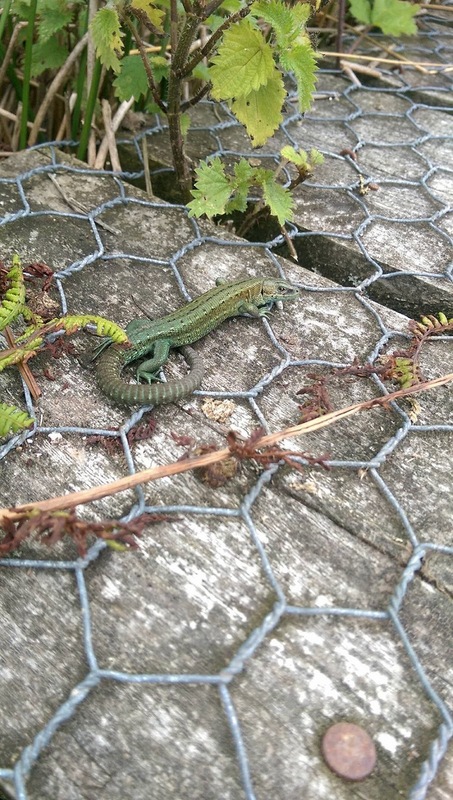 A little easier to spot during your visit are the common lizards. On sunny days they warm themselves on the board walk outside the hide at Moorey Mere. The common lizards are ectotherm (they can't generate heat themselves unlike mammals) and so need to warm their blood up by basking in the sun in order to hunt for small insects. 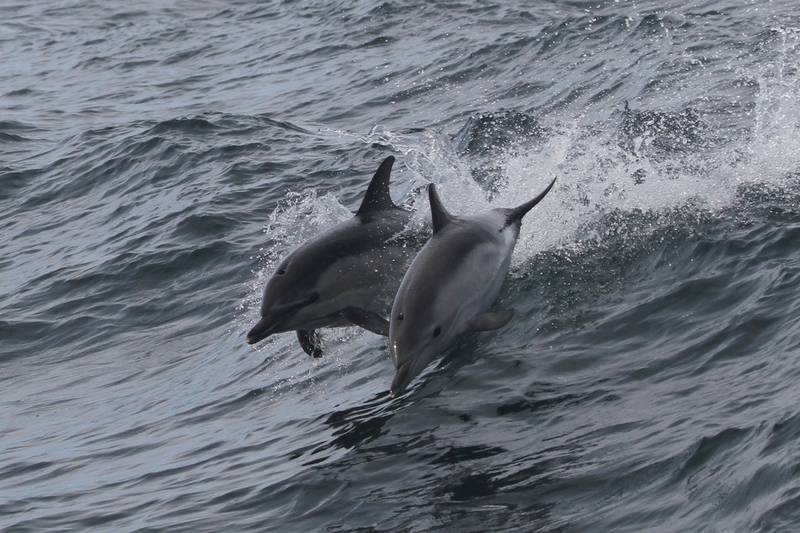 Look out for the blue coloured juveniles and the extremely small immature animals. Hi, my name is Cerren and I am one of the Long Term Volunteers here on Skomer for the second half of the season. I had never been to Skomer before, but so far I have enjoyed every second! Each day has been so different and enjoyable. Skomer is home to an impressive array of wildlife, and most people associate the island with its large colonies of seabirds, however, little attention is given to the shore life of Skomer. As I am currently reading Marine Biology with Oceanography at university, I have a keen interest in marine life and decided to go rockpooling in the intertidal zone along the beaches of Skomer. The intertidal zone, the area between the high and low tide, is one of the harshest environments for animals to survive in because of the changing environmental conditions. The animals living there have to cope with the stresses of changing salinity as it rains, the temperature as the sun heats the rockpools, long periods out of water as the tide recedes, and the mechanical strength of the waves. As a result, the fauna living in the intertidal zone have undergone some fascinating adaptations! Even though North Haven beach seems like a simple pile of rocks and boulders- it is teeming with life! Under the first rock I turned over, I found three shore clingfish also known as Cornish lumpsuckers. 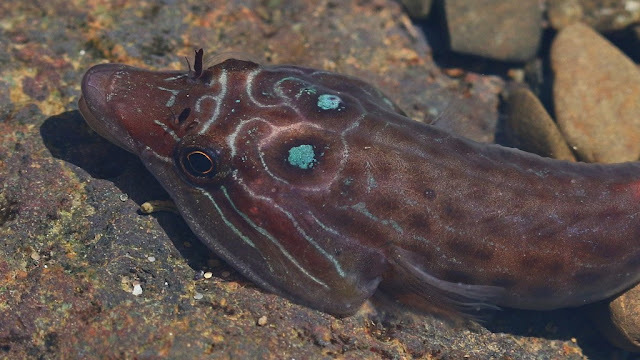 These fish have remarkable adaptations for example their pelvic fins have fused together to form suckers which help them to remain stuck to the rocks on exposed shores. 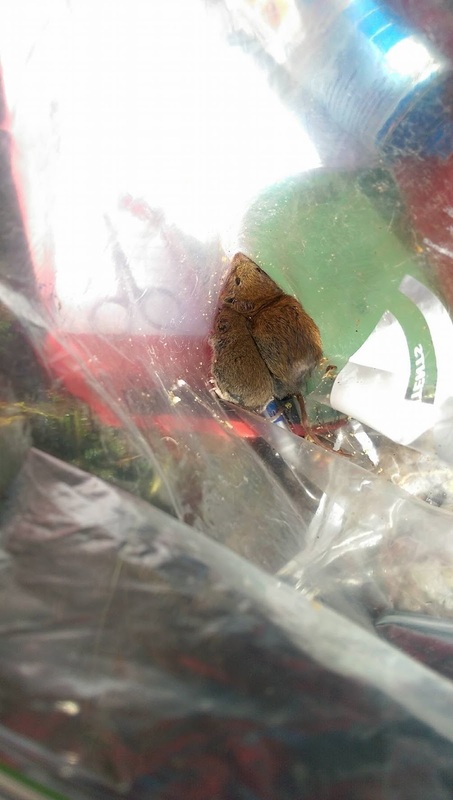 They are also covered in a layer of mucous which allows them to remain hydrated during periods out of water. Some other species that I found included the broad-clawed porcelain crab which has flattened hairy claws to catch small particles in the water, sea mats which look like tiny bubble-wrap on top of kelp but they are actually a colony of individual bryozoans and by-the-wind sailors which are free-floating hydrozoans from the same phylum as jellyfish (the cnidarians). 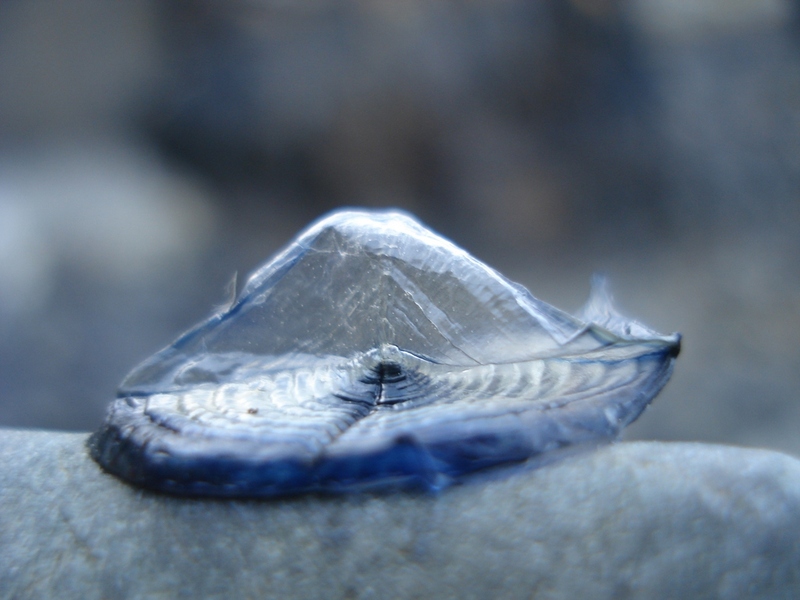 Like the jellyfish, by-the wind sailors also have stinging cells called nematocysts which they use to stun their prey. Normally, the public don’t have access to the beaches on Skomer to minimise disturbance to wildlife, but on Wednesday, I held a seashore spectacular family day activity. It was a very successful day with a great turn out of people. Around 15 children and their parents joined me for a two hour session of rock pooling on North Haven beach. The children loved finding the variety of invertebrates and vertebrates along the shore. Some of the species that were found included compass jellyfish, by-the wind sailors, keelworms, barnacles, limpets, topshells, dog whelk, anemones, shannies, blennies and common shore crab. Their favourite animals by far were the crabs therefore we all decided to have a competition to find the largest crab on the beach (the winner found a 5cm common shore crab). 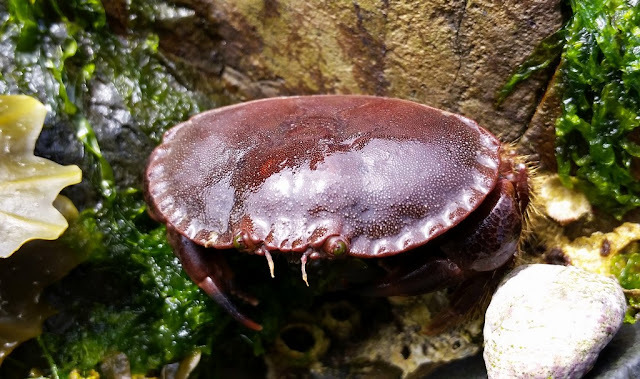 Next time you go to a rocky shore, check under the rocks to see what fascinating creatures you can find, but remember to place the rocks back gently where you found them! We try and take a few trips out each year to see some wildlife and give our volunteers a bit of a treat. On the evening of Saturday 13th of August we took a trip out to the Celtic Deep, which lies around 25 miles SW of Skomer, to look for seabirds (especially storm petrels) and cetaceans. As you can see we were successful. 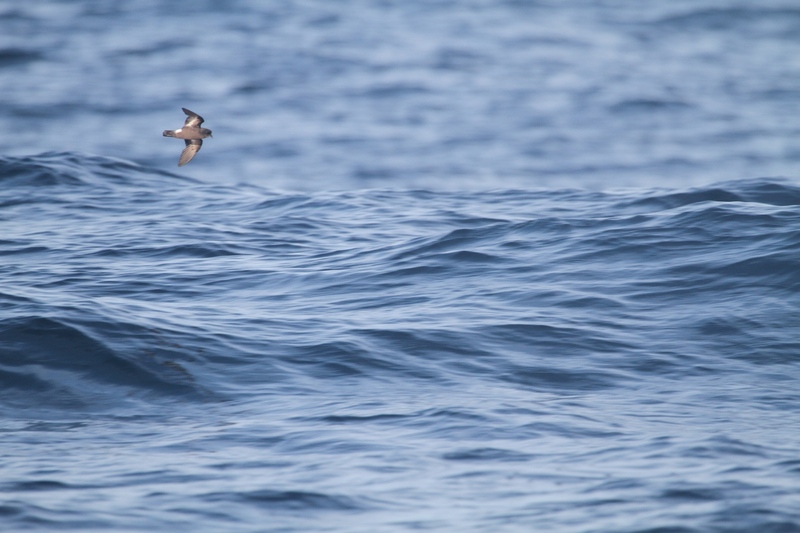 We saw over 40 Storm Petrels, plenty of Common Dolphins, as well as two Great Skuas and a Sooty Shearwater, and everyone involved had a wonderful time. What an amazing area we live in! Have a look at this video I took from my kitchen yesterday evening.